Instrument Cockpit Frame in Carbon Fiber. TFT Screen Frame in Carbon Fiber. Center Console Cover (MMI Frame) in Carbon Fiber. Door Handles in Carbon Fiber. Kick Plates in Carbon Fiber. Steering Wheel Spokes in High Gloss Black. Center Console Bezel in High Gloss Black. 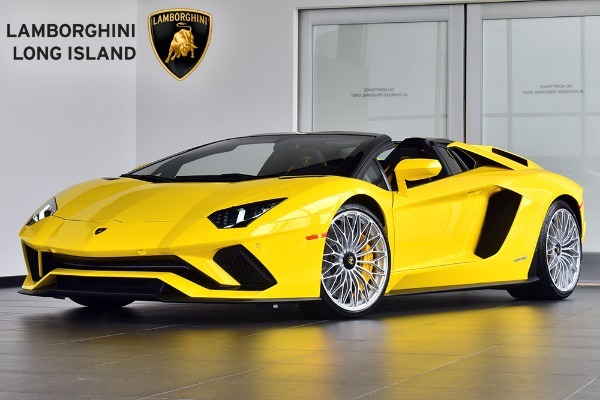 Lamborghini Shield Embroidered to Headrests in Giallo Taurus. Lamborghini Nameplate on the Dashboard in High Gloss Black. LED Light on the Kick Plates. LED Light under the Dashboard. LED Light on the Door Handle Opener. Auto Dimming Interior Rear View Mirror Including Compass Indicator. S Trim Sportivo Interior Bicolor Alcantara in Nero Ade and Giallo Taurus. Contrast Stitching in Giallo Taurus. Interior Trim in Leather with S Trim. Multifunction Steering Wheel with Perforated Leather Inserts. Fully Electric and Heated Seats.